You leave Pacific Northwest Ballet’s “A Midsummer Night’s Dream” haunted by four notes. They recur, quavering and shimmering, through Felix Mendelssohn’s glorious score, setting the tone for our entry into an enchanted realm. As played by the splendid Pacific Northwest Ballet Orchestra, those four chords seem to grow like a magic flower, while the dancers, choreographed by the matchless George Balanchine, arrange themselves within the sound, arms wafting as if blown by the breeze from a fairy’s wings. 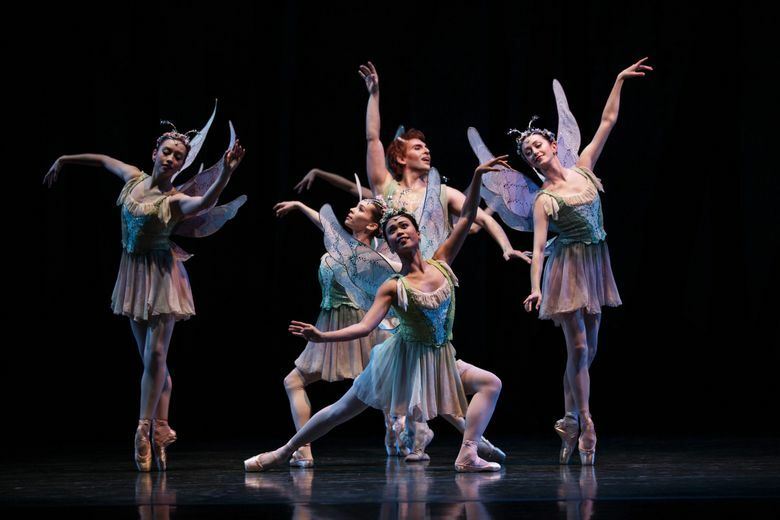 Balanchine’s “Midsummer Night’s Dream” has been in Pacific Northwest Ballet’s repertoire for several decades; the current version, beautifully designed by Martin Pakledinaz, debuted in 1997. It’s unusual among story ballets in that all the plot is crammed into a rapid-fire first act, full of thwarted lovers and scheming fairies and frantic running, followed by a brief second act that features an entirely random and utterly enchanting moonlit pas de deux, performed by dancers who didn’t even appear in Act I. And it’s a joy on every level: the music, the depth and wit of the choreography (I particularly enjoy Hermia’s Bourree of Despair, danced with hilarious angst on opening night by Rachel Foster), the spring-hued richness of the sets and costumes, the “bug corps” of young students from PNB School, tossing off perfect grand jetés and complex formations with visible joy. The opening-night cast was uniformly strong: Foster, Lindsi Dec, Benjamin Griffiths and William Lin-Yee as the (frequently mismatched) lovers; Laura Tisserand and Kyle Davis as the fairy queen and king, Titania and Oberon, and Joshua Grant as Titania’s cavalier; Ezra Thomson as the enchanted Bottom; Angelica Generosa as the world’s most charming (and fleet-footed) Butterfly; and Lesley Rausch and Jerome Tisserand performing that gorgeous, delicate Act II pas de deux, ending with the softest of falls into waiting arms.